I'm not sure what to say about The Laundry. 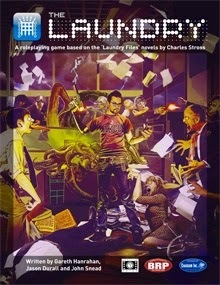 Cubicle Seven has routinely released great games and the product blurb alone had me reading the author list six times because I could swear one of my favorite British author's (Simon R Green) was involved. Sounds fun ... but BRP has always left me a little cold so this one is a maybe in my wishlist. Speaking of Simon R. Green, does anyone know when the next blasted Ghostfinders book is coming out! ?